I love pumpkin. My life goal is to make pumpkin a year round staple. Pumpkin pie in August? Absolutely. I made this for a barbecue and served with a scoop of vanilla ice cream. 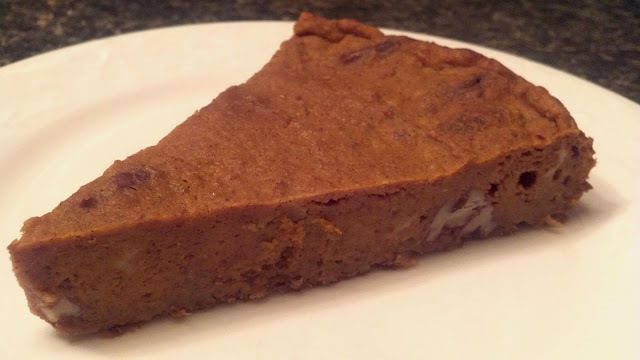 I chose to make a crustless pie, since the pie filling itself is not that high in sugar and saturated fats, and leaving out the crust will save a lot of calories, but still have optimal pumpkin flavour! When I was searching for a crustless pumpkin pie recipe, many of the ones I found included protein powder, egg substitutes, etc. I wanted to use standard ingredients, so I adjusted the recipe and came up with this. Preheat oven to 375 degrees F. Grease a 9.5 inch springform pan with canola spray or coconut oil. In a mixing bowl, combine all dry ingredients and mix until uniform. Add pumpkin, milk, eggs and vanilla and mix just enough to combine. Optional: Add pecans and stir in. Pour into springform and bake for 38-40 minutes. Pie should still be a little soft on top. Allow to cool for 5 minutes, then remove springform. Chill for at least 2 hours in fridge to set.